Are you annoyed of applications that open popups on every launch or at a regular interval, which you can not disable? Then PopupCloser might be what you need. 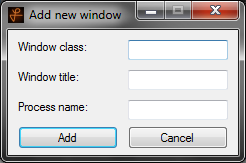 It allows you to specify windows by their title, class or process name. As soon as these windows appear, PopupCloser will immediately close them, most of the time you won’t even notice that the window wanted to open. This is done without intensive CPU usage. The system notifies PopupCloser about any window that gets created, the majority of it’s runtime PopupCloser will just lay around and do nothing, but when a matching window appears, it will be closed immediately. Another feature is that PopupCloser disables your keyboard when a matching window pops up, so you can not activate a button in the window by pressing enter during typing. 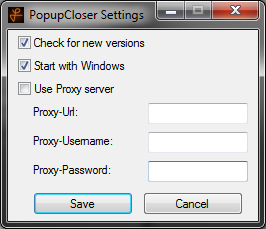 Just download the latest version of PopupCloser and extract it to any directory. It’s that simple! Just run PopupCloser.exe. Then, right click on the tray icon and open the settings. Set everything up suiting you. 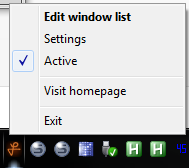 Afterwards, right click on the tray icon again and click ‘Edit window list’. Click ‘Add new’ and put values into the edit fields. If you leave a field empty, it will be skipped in the checking routine. That means, if you set Title to ‘windowtitle’, every window with the title ‘windowtitle’ will be closed, no matter which process or class it belongs to.